A pioneering Sri Lankan education institute with over 15 years in the field, the International Institute of Health Science (IIHS) has partnered with the University Of Aberdeen UK, ranked 4th in the UK for Medicine. This is one of the biggest brands in Medical Education to enter Sri Lanka and South Asia. “Ranked 4th in the UK university system, the University of Aberdeen has over 500 years of history. IIHS is very pleased to partner with this prestigious globally accepted medical program. Currently, there are limited seats available for Medicine for International Students so IIHS and the University of Aberdeen have worked together to introduce a one-year Pre-Medicine program to provide a pathway to the highly competitive University of Aberdeen Medical program in Scotland,” said Dr. Kithsiri Edirisinghe, Founder/Director of Academics, IIHS and Honorary Clinical Senior Lecturer, University of Aberdeen, UK. IIHS, being an International University Learning Center provides local and regional students the opportunity to access world-ranked universities for an affordable price. Over the years, IIHS built its name in the industry where it has become widely recognized for developing quality healthcare professionals in not only the field of Nursing but also in areas such as Physiotherapy, Bio Medical Science, Health Management and Teaching. Launched recently, the Certificate of Higher Education in Pre-Medical Studies is a collaborative program between the University of Aberdeen and IIHS. The University of Aberdeen is home to the oldest chair of medicine in the English-speaking world, established in 1497, and has one of the largest health campuses and excellent facilities for teaching medicine in Europe, whilst IIHS is one of Sri Lanka’s leading health care training institutes. 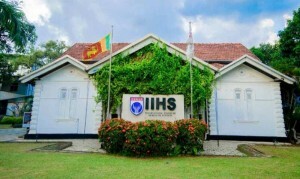 Staff from IIHS and from the University of Aberdeen delivers training for the program entirely at IIHS’s Colombo campus, thus minimizing travel and accommodation costs for students. Courses cover chemistry, biochemistry, microbiology, cell biology, anatomy, physiology, sports science, and health & healthcare. Successful students receive the award of Certificate of Higher Education in Pre-Medical Studies from the University of Aberdeen and they might then follow a number of different routes. They can apply for entry to the MBChB program at the University of Aberdeen, they may be eligible for application to medicine at other medical schools (subject to their entry requirements), they can articulate directly into the second year of one of the medical sciences BSc program at the University of Aberdeen, or they can articulate directly into one of the biomedical sciences program at IIHS. Call Nadeeka on 0114651144/0711660441 or email her on nadeeka@iihsciences.edu.lk for more information. In Sri Lanka, a large number of students seek international education and IIHS provides pathway opportunities for students to achieve their global dreams at a cost-effective price. For a nominal price, IIHS provides students with the opportunity to receive a quality education and be a globetrotter while achieving a promised return of investment through ample job opportunities. In addition to the noticeable education outputs, students gain access and entrance to world-class Universities whilst receiving a certificate valid in Australia, Europe and many Commonwealth countries. IIHS provides a comfortable learning environment, which understands and nurtures student-centricity. The importance of student-centricity has been highlighted in international education delivery standards, where teachers ought to move away from the traditional teaching methods, which draw upon a teacher-centric classroom. The faculty of IIHS consists of experienced and younger staff. The experienced staff arm students with a range of quality values and the youthful staff provide information on modern trends and learning styles. Valuing a SMART learning environment, with a continuously upgraded curriculum through the input of its partners and aligned with international trends in education and teaching, IIHS produced the first Collaborative Teaching in environment in South Asia – a system which supports learning outcomes whilst students are provided with ownership of their learning experience. IIHS prides itself on being the No. 1 in terms of Research, Evidence Based Practice and Reflective Practice arming students with a skill set to understand innovative and unique trends in healthcare. Further, students during their time at IIHS engage in multiple Community Projects so they build empathy and learn about existing local and international concerns at a community level. In order to develop a “Worldly” Student, who has a quality foundation, IIHS has identified multiple areas in the learning process, which would make a student internationally geared. Distinct areas and features include personality development and soft skill development whilst gaining a thorough understanding of traditional methods education versus modern virtual education.